Why use Wise PC Doctor? 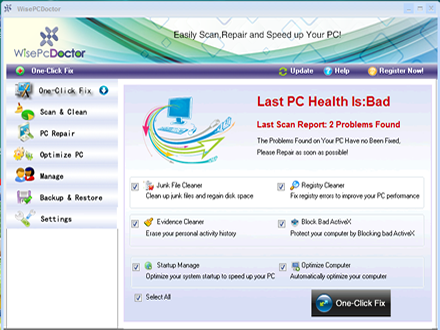 Wise PC Doctor One-Click Fix tool will easily scan, repair, and optimize your computer system. Your PC's overall hardware and software performance will be improved immediately. One-Click Fix tool removes temporary files, cleans your registry errors and deletes junk files to optimize the performance of your computer. Wise PC Doctor allows you to fix registry errors to keep your registry running faster, deletes junk files, duplicate files and invalid shortcuts to increase hard drive space, clean browser history to protect your privacy and clean spyware to ensure the security of your computer. The system cleaner tools can do a lot to make sure that your system is running to the peak of its ability. Optimize your system, clean and repair Windows registry, fix PC crashes and error messages, restore IE default settings. Moreover Wise PC Doctor can repair shortcuts and file association to avoid system crashes. Wise PC Doctor's system optimizers will clean and optimize your PC, making it running faster and more efficient. It will also get rid of all of unnecessary files that crash your PC and make system instability. Its startup option gives you the ability to automatically remove junk files that you wish to do when windows starts.By using Wise PC Doctor regularly, your system should not only be more stable but it will also help streamline your pc registry without expensive hardware upgrades. Wise PC Doctor can completely clear the logs of chatting, website browse and programs use in the computer in order to protect the privacy of personal information. Please visit our website to know more.